You’re driving along enjoying your ride, and suddenly you see something fly towards your windshield. The next thing you know you have a chip or crack running down the glass. A crack or chip that is small in size isn’t just an annoyance, it’s also a safety hazard and impacts your visibility while cruising down the road. It’s cheap and easy to ignore the blemish, but it’s not something you can do. Debra Levy, the current president of the Auto Glass Safety Council (AGSC), states that cracks and chips that aren’t repaired get larger or wider over time. Chips and cracks can compromise the glass and make your vehicle more dangerous since it’s an essential part of the safety system. If you’ve got a broken windshield, we’ve got two options to deal with it at Sunny Side Glass North. If you’re lucky and it’s a small or thin crack, you might be able to have it fixed without a complete windshield replacement. Wide, long, or deep cracks will require you to purchase a new windshield, which is pricier than a repair. A windshield is a bigger deal than a scratch or small dent on the body since it’s not just a cosmetic issue. A number of factors determine if the crack can be repaired. These include size, the type of break, location, and how long it’s been since the damage was done. Since cracks can expand days or weeks after the impact, fixing it sooner rather than later gives you a better chance of saving money. A general estimate is that cracks smaller than 14 inches can be fixed with windshield repair, although expert capabilities depend on the auto technician. Some insurance companies limit repairs to smaller than 14 inches, so you’ll have to check with them to know what to expect. Damages that penetrate through the outer layer of glass to the inner one can also not be repaired due to the depth of the damage. How does a technician fix or replace the windshield? Fixing a crack takes around 30 or 40 minutes and involves inserting clear resin into the crack. Once the resin hardens, the technician uses a UV light to cure it. The process prevents the crack from spreading or getting deeper and restores the appearance of the glass. 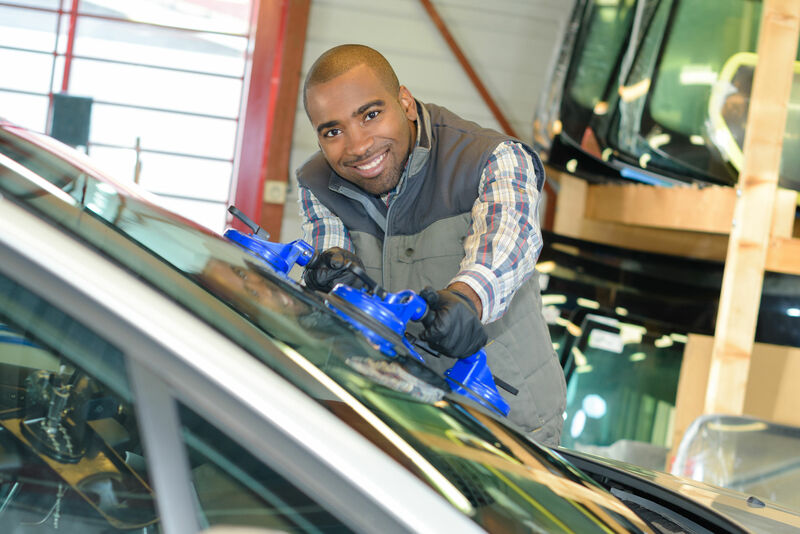 A full windshield replacement requires removing the damaged windshield, adhesives, and seals from the car. The technician applies glue to the original frame and fits the new windshield into place. You’ll need to wait about an hour before driving anywhere to ensure the new windshield has time to attach itself to your car securely. You might question the capabilities or trustworthiness of a technician when looking for an individual or company to fix your glass. Our experienced technicians at Sunny Side Glass North can help get you back on the road quickly without compromising quality or safety.